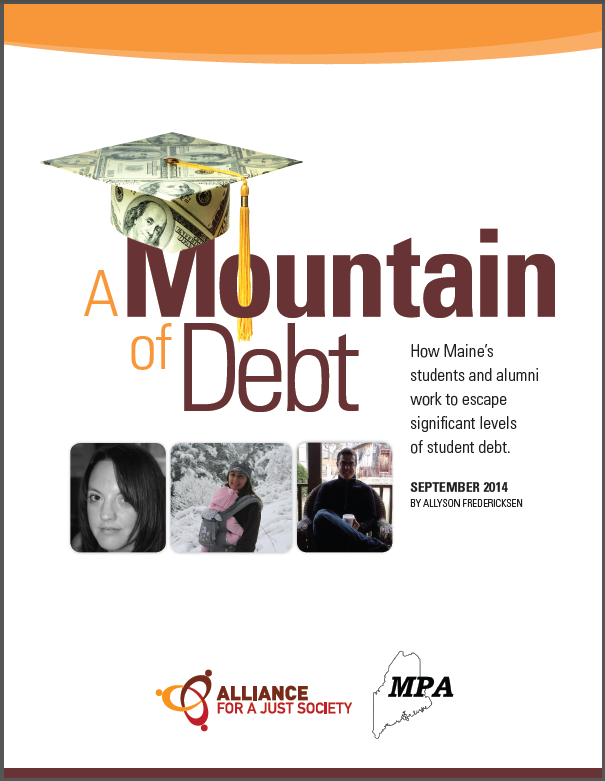 A new report authored by the Alliance for a Just Society and released today by the Maine People's Alliance evaluates the scope and consequences of rapidly increasing student debt in Maine and provides a window into the lives of Maine students and alumni facing large amounts of debt. Graduating students in Maine now face an average debt load of $29,352. The debt to median income ratio for Maine students is the 11th highest in the nation. "Having such a heavy debt load narrows my options and increases my stress," said Jocylin Egan, nursing student facing $55,000 in debt upon graduation, speaking at a press conference held on the campus of the University of Southern Maine. "My passion is working with populations that have less access to health care but it's going to be difficult to pursue the kind of work within the healthcare field I desire. Many of my friends are in similar situations and so a whole generation of Mainers are not able to be as focused, as entrepreneurial and as compassionate as we could be. It limits our futures and the future of Maine." In addition to an analysis of the financial and policy landscape of student debt in Maine, the report also contains survey results from students and recent alumni and personal interviews with Mainers facing large student debt loads. Eighty percent of participants who reported that they had student debt in a voluntary online survey of 127 Mainers noted that it affected their housing situation, with sixteen percent living with their parents for financial reasons. "This mountain of student loan debt blocks the path for prosperity for too many Maine graduates, especially those from low and middle income working families," explained Christy Dagget, a policy analyst for the Maine Center for Economic Policy. "Debt forces Maine graduates to defer goals their parents took for granted: a home of their own, investments for their kids' future, and a nest egg for their own retirement." "College costs are surging and because of that, too many students are forced to underwrite their higher ed costs by getting deeper and deeper in to debt. College students are forced to work multiple jobs, live off of credit cards, and take on irreversible debt just to stay in school. And for some, this is too much to sustain," said Senate President Justin Alfond of Portland. "The demands of today's workforce require higher education and specialized training. And so we need to make sure that college debt isn't a barrier to college entrance or degree-completion." According to Maine People's Alliance Campus Outreach Coordinator Julia Legler, debt has been a motivating factor prompting students to register to vote and become more involved in the political process. "It is vital that Maine students participate in this conversation, as student loans have such a monumental impact on their lives," said Legler. "In an effort to elevate these voices, we are currently working alongside several other civic engagement organizations to register student voters across the state. We have so far registered 1,300 students to vote this year, and plan to register at least 500 more before November."